Gnosticism is one of the most ancient philosophies or ideologies known to man. It had its origin in paganism but burst into full flower when several groups who appropriated its teachings eventually broke from early Christianity. Many are not aware that Gnosticism is still quite active and alive. Today, this ideology is found in several religions of the East, in the New Age movement and also in secular modern thought. At the heart of Gnosticism is a hatred of the material world, in particular, the human body. One can already see traces of this in the transgender movement. The pagan Gnostics rejected the material world as the evil creation of an inferior Demiurge, the world-making deity, that later Gnostic heretics identified with Creator God, as revealed in the Old Testament. Against the orthodox understanding of the goodness of all creation, they believed that the material world was irredeemable, and therefore that human redemption meant salvation of the immaterial soul — the divine spark—from its imprisonment. The doctrine of total depravity in Calvinism which has influenced much of Protestantism is quite loosely similar to this notion, thus the Protestant distrust and even rejection of any physical or visible representation of the divine. All this is of course at odds with our Catholic sensibilities. Catholicism is physical as it is spiritual. Physicality is at the heart of the principle of sacramentality – “outward sign of inward grace” – the invisible concealed and revealed in the visible. Our faith is not about ideas or dead texts found in a book, but about the Word becoming flesh. This is what the Incarnation means – “in the flesh.” It is centered on one born of a woman, born under the Jewish law, to save us not through the promise of future incarnations of our 'spirits', but through the offering of His body once and for all. The ministry of Jesus is to poor human bodies. He opens eyes so that they see, ears so that they hear, and He loosens tongues so that they speak. 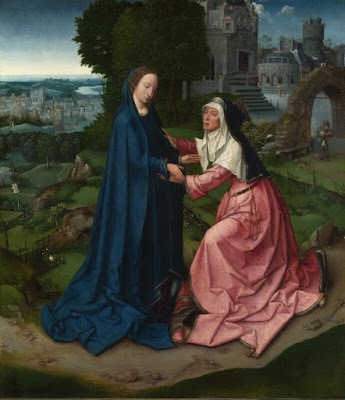 Likewise, the scene of the Visitation is pregnant with the physical (forgive the pun). The visitation of Elizabeth by Mary is about bodies: pregnant bodies, a kicking foetus, sounds reaching ears, and mouths speaking. Elizabeth hears and believes and proclaims. Our attention is drawn to her hearing and her speaking. Even the movement of the child within her womb is a revelation. Revelation is communicated to Elizabeth and faith is established in her through physical events: her meeting with Mary, their conversation, John the Baptist leaping in her womb, with the Spirit working through these things. Not just spirit, but spirit and flesh. Likewise in the second reading from Hebrews we are told that Jesus, on coming into the world, is given a body. By presenting Christ’s taking flesh in this way, Hebrews tell us a number of things about the mystery of the Incarnation. They tell us first about the importance of the body, of Christ’s body. Christmas is a very physical affair. It is about God, who is wholly spiritual and immaterial, sharing in the material bodily lives of our humanity, so that we may have a share in His divinity. It recognises the fact that we are bodily creatures, part of a material creation, and that our bodies and the physical world around us are of real value in the eyes of the God who created them. Our bodies are essential to our common life together, to the way we communicate one with another, and share our lives with each other. All this was affirmed when God communicated with us, spoke with us, by becoming one of us, by taking a human body to Himself from the body of a human mother, when the Word became flesh. But Hebrews does not tell us only of a body. It tells us about Christ’s activity. Christ has come to do God’s will. The human body, human life, is brought to perfection by the action of Christ. The Son of God, did not just come to heal our bodies but He came to suffer and die, and He rose again, in order to become the source of our salvation. He came not only to save the immortal spiritual soul, but our physical bodies. Here we see how the communion between us and God is restored: Christ takes a body that can die. It is not enough for Him simply to be human, and it is not enough for us simply to be human. He does God’s will, and so brings us the forgiveness of our sins. No longer need we take animals to represent our sacrifice, no longer do we need to make any burnt offerings for sin: it is done in the body of Jesus Christ offered once, and for all, and continues in the offering of ourselves, our bodies, in union with Him in the Holy Sacrifice of the Mass. We participate by grace in Christ’s offering of Himself, by receiving His body and blood at the altar, and by becoming more deeply as members of His one body, offered in one Spirit to the Father. Ours then is a physical religion. At its heart is the woman who said 'let what you have said be done to me', and the man who says 'behold I have come to do your will in the body you have prepared for me'. The physicality of the Visitation, and in fact of the other great events in the history of salvation recorded here in the Gospel of St Luke; the Annunciation, the Nativity of our Lord, His Passion, Death and Resurrection, all point to the physicality which we experience whenever we enter our churches. It points us to the tabernacle where not just the soul or divine spirit of Our Lord resides, but where both His soul and divinity, body and blood are physically, really, substantially and continuously present. If you love our Lady, you must love the Eucharist. You see, the primordial tabernacle, the first vessel for Jesus Christ, is the Blessed Virgin Mary. How do we react when we find ourselves so near to our Lord, to His “physical” presence? John, the child in Elizabeth’s womb, could not contain his joy and leapt, danced, rejoiced at the approach of Jesus. I think it is fair to say that few of us react with such poignant and uncontainable joy when we come close to our Lord. In every Catholic church, there present is Jesus Christ – in His Body, Blood, Soul, and Divinity. Fully, truly, really, and substantially present. This is not a mere symbol, nor even some manner of imperfect presence. Far too often we are guilty of falling scandalously short of appropriate reverence for the Eucharist. Let us pray that we will experience the same excitement as did a child in his mother’s womb. I would like to make a final comment on the Feast of the Visitation, which is now celebrated on the 31st of May every year. In the year 1389, Pope Urban VI extended the celebration of the feast of the Visitation to the entire Church. It was a tumultuous time for the Church, who was experiencing the effects of the Great Schism – the Church was divided into East and West. Urban VI hoped that Christ and the Blessed Virgin Mary would visit the Church and put an end to the turmoil. In our busyness to make preparation for Christmas, let us never forget to ask our Mother to pray for the Church and put an end to the turmoil we are experiencing now.